Alexander Rodin is an icon of Belarusian contemporary art. You can examine his artworks for hours, they literally eat you up. The entire galaxies of details, images and motifs open up an absolutely new and mysterious world. Unfortunately his exhibitions have been held in Belarus very rarely. Here is an interview by Zmitser Plyan where Alexander Rodin explains why it’s so. Ales*, you’ve been living in between Minsk** and Berlin lately. What is Berlin for you? You’re right, it happens so that I’ve been living in Germany a lot. And present-day Berlin is a place interested in art; it needs art and also demands it. Berlin has become that kind of art-space which draws global cultural life – ambitious exhibitions and huge concerts have been organized there. It’s very appealing to me and to people who attend these events. Berlin is a magnet for a large number of painters, writers and performers. It attracts Belarusians as well. Nowadays Berlin has become a cultural center of Europe, its heart – and it’s seething. I am an artist and exhibitions are my life. And when I suggest a concept of an exhibition or an event and see that it fascinates Germans – why not to organize it there? Why not to hold an exhibition in Berlin when it acknowledges my creativity? Talking about Minsk, your native city, is there any space for self-actualization? I would say, we have kind of complex situation in Minsk. There is less and less room for manifestation of creativity with each year. You can observe a strong influence of commercialization on art. And it brings no benefits to art and it doesn’t lead to development of independent art schools. But art should be getting a boost. I mean, support from the government and community. Belarusian artist cannot afford renting a gallery or museum since it costs a lot of money. Minsk has facilities that can be used for exhibitions and art projects. Why aren’t they engaged into displaying independent, contemporary art? Why nothing is going on there? Yes, once there were people who pushed forward and sustained Belarusian art, but no one does it nowadays in Belarus. On the flip side – people who stay there and are in charge – they’ve just been ruining our art. It seems that these individuals wish there wasn’t any art in Belarus. For the time being, it’s very difficult to be an artist in Minsk, it’s difficult to express yourself, to arrange a one-man show, performance or action. At the same time every society calls for art, actually it craves it. At these days we have quite a number of striking artists and they should be supported. Ales, and what’s about your latest art show in Berlin? 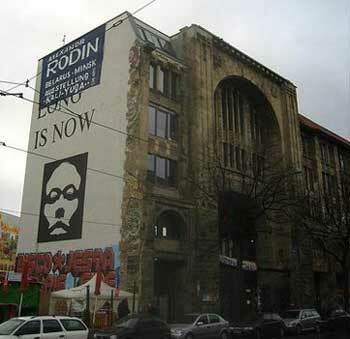 It ran last summer at a well-known Kunsthaus Tacheles. This place attracts artists from all over the globe. Administration provides an artist with a studio and with display space. I’ve already collaborated with Tacheles for seven years. I am given the showroom that equals to the entire space of the Palace of Arts in Minsk***. I’ve gotten an international exposure. I present my art there and see that my works inspire the audience. And this feedback powers my creativity in turn. Last year at Tacheles my colleague Vladislau Buben and I launched an art festival ‘Dach’****. We had a number of underground and electronic musicians from the entire world, as well as from Belarus, playing there. I hope, this year we will be able to arrange it once again. * The artist’s name sounds ‘Ales Rodzin’ in Belarusian. ** In his answers spoken in Belarusian, Alexander refers to the original name of the city, which is ‘Mensk’. The name ‘Minsk’ is a Polish variant, adopted in the Russian Empire and then anchored by the Soviets. *** The largest exhibition hall in Minsk. **** ‘a roof’ in German and Belarusian.